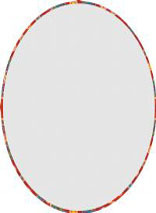 Suitable for making all types of Oval rigid lampshades. Can be used with all UK and European fittings. Set includes 2 painted lampshade rings. One ring has a standard 40mm European fitting which is fitted with a 25mm converter plug. (includes 15mm for the overlap). The height of the panel is determined by you, the height you would like the lampshade to be. We can also supply Self Adhesive Lampshade panels to go with the ring, we offer 4 heights for this frame, 150mm, 200mm, 250mm and 300mm.